NEW YORK (Scrap Register): United States silver scrap prices advanced on the Scrap Register Price Index as on Wednesday, tracking the uptrend in silver futures prices at New York Mercantile Exchange as investors fretted about the global economy and trade tensions and the European Central Bank and the U.S. Federal Reserve showed signs that monetary policy will remain accommodative. 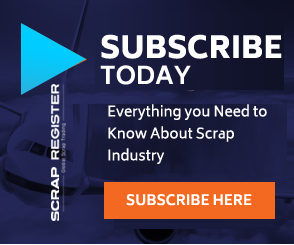 The major silver scrap commodities on the Scrap Register Price Index showed an uptrend on Wednesday. The hallmarked silver scrap prices gained by 0.07percent to $12.550 an ounce and non-hallmarked silver scrap prices dropped to $11.140 an ounce. The most active May Silver contract on the COMEX division of the New York Mercantile Exchange has advanced by 0.20 percent to $15.244 an ounce on Wednesday. Brexit uncertainty, the Trump administration's threat of imposition of tariffs on a range of EU goods and skepticism about U.S.-China trade agreement, all dented investor sentiment. The IMF cut its global growth forecasts for 2019 to 3.3%, the slowest expansion since 2016 and from its earlier projection of 3.5% in January.